Print your logo onto these custom printed executive pu leather power banks 8000 mah or one of our other innovative fastest promo items (1-4 days) and use them in your next marketing campaign as a unique giveaway item. Executive PU Leather Power Banks 8000 mAh is the ultimate powerful power bank. Neatly surrounded with a soft black faux leather exterior, this is the executive on the move power source. Executive Power Banks laser engrave to a stylish mirror finish and are supplied in a black box. Branding: Mirror Finish Plate 45mm X 15mm H.
Other innovative corporate gift ideas that could be suitable to create brand awareness include these cheap promotional 20k Ultra Powerful Power Banks, quirky advertising gifts such as these 10k Ultra Powerful Power Banks or how about using one of our more bespoke custom made products such as these great quality Powerful Power Banks (8000 mAh)? Custom brand these small flat magnetic photo frames or one of our best-selling promotional fast corporate gifts»fastest promo items (1-4 days) with your company logo! Engraving your logo on the promotional executive pu leather power banks 8000 mah is usually done by Laser engraving, where the laser removes a thin layer of the metal surface. 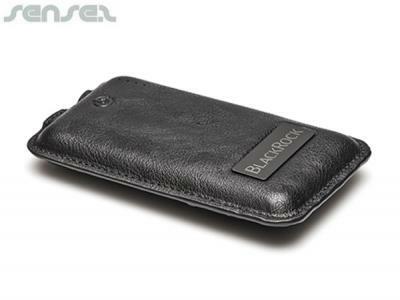 Your logo becomes part of the executive pu leather power banks 8000 mah and is impossible to remove. Sometimes the engraved effect will be a different metal colour to the outside metal coating of your product. We can also engrave wood or plastic. Engraving is usually a more expensive branding method. Personalize your executive pu leather power banks 8000 mah or custom design fastest promo items (1-4 days) for your marketing campaign. How can these unique promotional executive pu leather power banks 8000 mah or our personalized fastest promo items (1-4 days) fit in with your marketing strategy and help you maximize your brand exposure? Our custom made Executive PU Leather Power Banks 8000 mAh can be produced from a minimum quantity of 10 pieces. We can have your logo branded on these corporate Executive PU Leather Power Banks 8000 mAh in Engraved. A setup fee of US$112.00 will apply to make the film.